The weekly unemployment claims data used to garner headlines and bottom of the hours first news status on television. This data now is bottom of the bird cage news. It is rarely referenced in the chyron on the news. We have seen steadily decreasing first-time claims data and continuing claims data for nearly a decade. The level of continued insured has grown during this period. More people are working. Fewer are unemployed. More are participating. Record Setting Year. The First-time Claims data set a record with 21 weeks under 200,000 non-seasonally adjusted claims during the year. 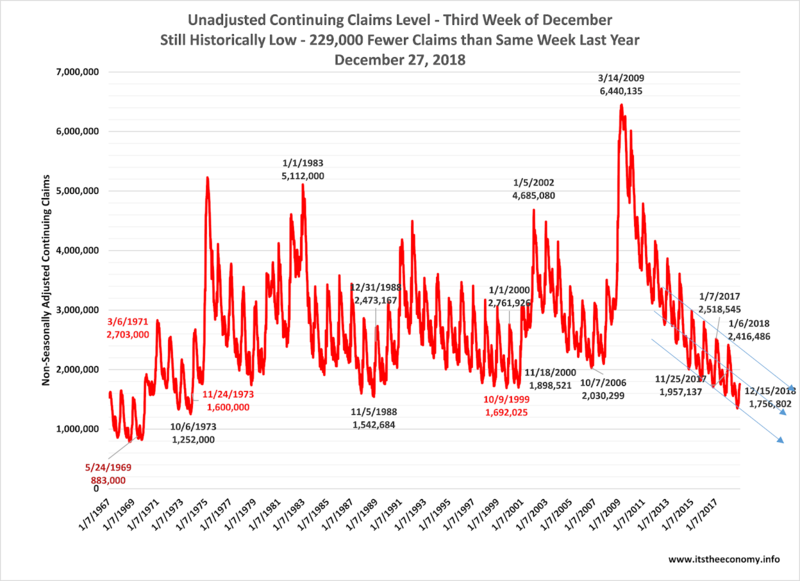 The headline record that has been ignored is the number of weeks with seasonally adjusted claims under 300,000 claims that “started” under former President Obama. This is an economic urban legend. It started and stopped many times while the former President was in office. The most recent streak started after Thanksgiving 2016. This year we set the record for the most weeks with the non-seasonally adjusted first-time claims under 200,000 claims during the week of October 27th. We set a record for the lowest percentage of Insured Unemployed during the week of October 6th when only 0.95% of the covered insured population were receiving continuing unemployment benefits. The number of first-time claims and continuing claims tend to rise between October and the first week of January the following year. Even under strong economic conditions businesses close up shop at the end of the calendar year. Last week the NSA FTU claims data dropped to 251,773, the lowest for that week of the year since December 21, 1968. The SA FTU could have been reported under 200,000 one more time this year. What was recorded and what was reported this week? 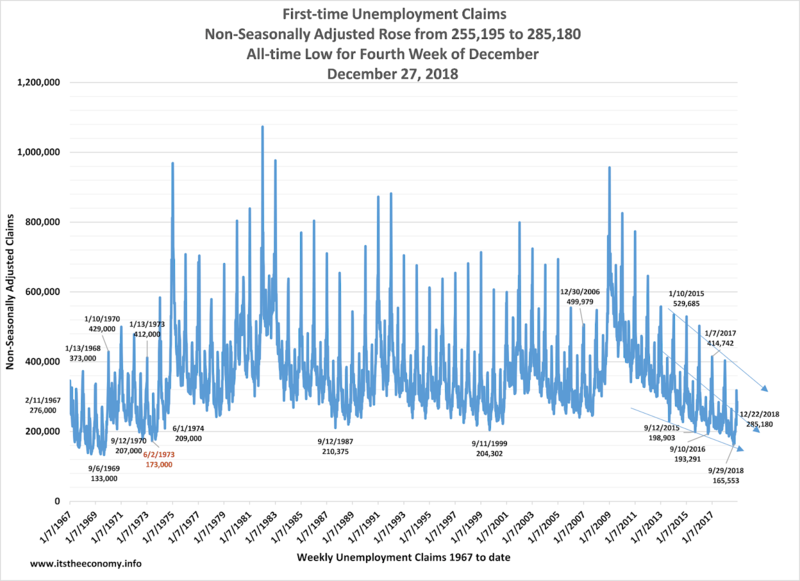 We recorded the lowest ever first-time unemployment claims data for the fourth week of December. There were 142,513,638 “covered insured” this week. There were 52,640,400 covered insured during the week ending December 25, 1971. We have ot covered insured data for 1967 through 1970. We had fewer first-time claims with 90 million more potential claimants. The Seasonally Adjusted First-time Claims data could have been reported under 200,000. If we used the seasonal factors used the early 2000s then we might have had a number under 200,000 reported. The Non-seasonally Adjusted Continuing Claims data was recorded at 1.756 million claims. This value is 229,000 claims lower than last year’s level. This level is lower than the the “best” for 2000 through 2016. The Continuing Claims data was reported at the lowest ever for the third week of December. The continuing claims level lags the first-time claims data by one week. We have 90 million more covered insured and only 700,000 more continuing claims than we had during the late 1960s. Even so, the seasonally adjusted was reported at just over 1.7 million claims. The Insured Unemployment Rate is 1.23%. The talking heads like to compare the job openings data to the U-3 unemployment rate or the U-3 unemployment level. These are two different surveys measuring two very different things, with differing sample sizes and differing error rate levels. Why not compare the job openings with the continuing claims level? If people continue o receive unemployment claims why not snap up one of those jobs? What does this mean? In theory, we have fewer continuing claims than we had last year at the time closest to the Monthly Jobs Report collection date, and this should mean that we have a lower U-3 unemployment rate and U-3 level than we had last year. These why are two very different surveys. The U-3 data is those people out of work actively looking for work. The continuing claims data measures those who had a job, lost a job, qualified for unemployment benefits, and are looking for work. This data really has very little impact on the Jobs Report Unemployment data. This data was seriously good data. It is being ignored due to a hyperventilating stock market and the government shutdown. Happy New Year. We will see if a report is released next week.